Baltimore, Maryland — After a historic win over then #4 North Carolina A&T, Morgan State returned to Hughes Stadium to face SC State. As fans celebrated 151 years of Morgan State during their homecoming festivities, the two teams had a slugfest for the ages. It was low scoring but every drive had the crowd locked in. 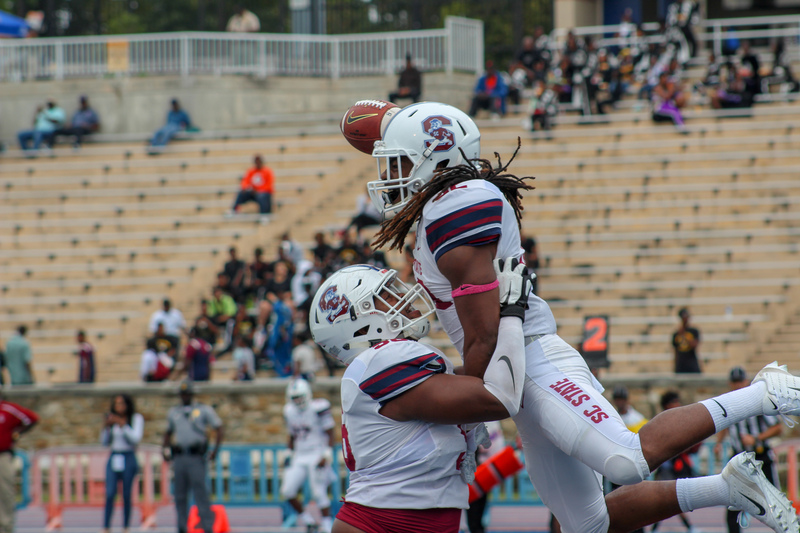 After an SC State punt, Morgan State started off the scoring during their first drive. Alex Raya added three points to the board due to SC State’s poor field position during their previous drive. The early score did not shake SCSU as they went on a 75-yard drive that lasted over five minutes. Jarius Jenkins capped off the drive with an 11-yard run. MSU responded with a 70+ yard drive of their own. A DeAndre Harris passing touchdown to Corey Holmes ended the drive. Backup QB DJ Golatt Jr added a Two-point Conversion. The defenses took over after that drive. Within the 2nd and 3rd quarter, there were only seven combined points scored. SCSU held on to a 14-11 lead coming into the 4th, a very entertaining one. Jordan Riggins scored for MSU early in the 4th. The Bears tried to hold on to an 18-14 lead, and they did. But SCSU silenced the crowd with less than two minutes left in the game. Tyrece Nick completed to Omar Cummings for a TD; capping off an 80-yard drive. MSU had a three-point deficit and marched into the SCSU territory, but a late INT sealed the deal for the Bulldogs. The Bears had numerous opportunities to put the game away, but found ways not to. Kicker Alex Raya missed three kicks, all towards the end of a quarter. When trying to get the lead before halftime, a kick was missed. When trying to tie the game in the 3rd, an opportunity failed. And when trying to make the score 21-14 in the 4th; the Bears did not get a field goal. Leaving 9 points on the field hurt MSU at the end. Offensively, it was an ugly game but both QB’s were the stars of the day. SCSU QB Tyrece Nick had 139 yards passing and 45 yards rushing. MSU QB DeAndre Harris had 141 yards passing and 78 rushing yards. Nick had TD’s in the air and the ground while Harris had a passing TD.